Experience the very best Wichita has to offer in airplane hangar space. Please contact us to learn more about our first-class facilities. All of our facilities are equipped with secure access to ensure safety and security for you and your aircraft. With 28' high and 120' wide hangar doors we are able to accommodate jets as large as Gulfstreams and turboprops. Take the stress out of travel by relaxing in one of our client lounges. Our amenities include: flat screen TV, kitchenette with complimentary drinks, direct tarmac access, accessible computer and free WiFi for your personal devices. Do you have a corporate jet and are in of need pilot offices and maintenance crew onsite? We offer several options that can be tailored to fit your needs. 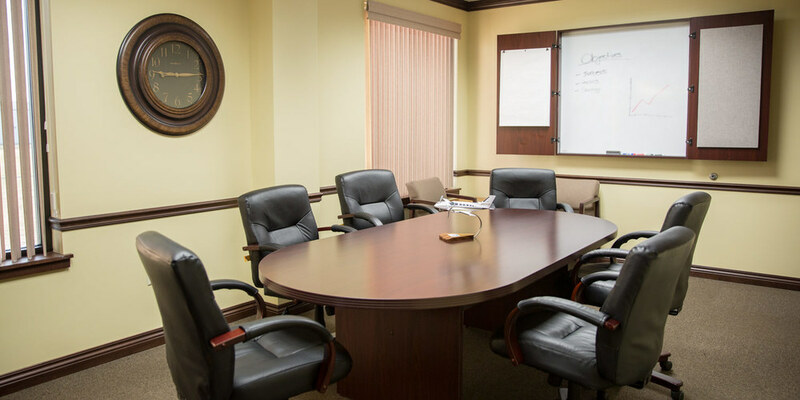 Private conference rooms are also available to reserve for meetings.